Adding a Transom Dormer Package is a great way to add stunning architectural detail to your shed! 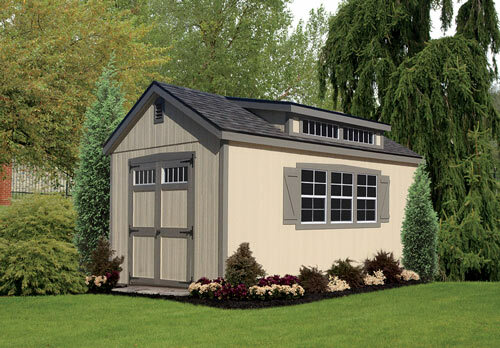 In addition to storage, these sheds can become a great place to create an art studio or extra home office space. Transom Dormer Packages are available with for almost all our shed styles as long as it has a shingled roof. The dormer is not available for treated wood or metal sheds. The Premier Transom Dormer Package is larger than the standard dormer and is perfect for our larger sheds such as the Premier Shed.